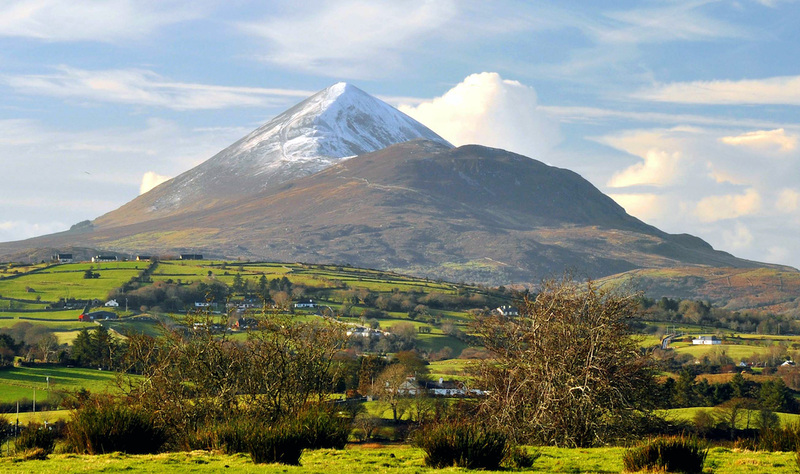 Mayo.ie's great shot of Croagh Patrick. Picking up from where I left off in my last post, Kev and I were in Westport, Co. Mayo, on a clear and sunny day, which meant we felt obligated to climb Croagh Patrick, the holy mountain a few kilometers away from the town, rather than explore Westport House as we'd originally planned. We found a taxi willing to take us to the base for a tenner, so off we went. I’m going to be completely honest in this post even though it’s not going to make me look very cool: I rather dislike hiking. I would much rather do a six hour walk on flat-ish terrain than a two hour one uphill. It’s not that I don’t like physical exertion or resent getting tuckered out – for some reason I just really don’t like the sensation of climbing, constantly pushing up with every step. It’s lame, I know. I’m a sucker for a good view though, and what lady doesn’t like feeling the accomplishment of completing something difficult – so occasionally I make myself do it. On the drive to Croagh Patrick I started to stress quite a bit though, seeing how steep the last rise of the mountain was! Check out that view! I'm so HAPPY about it! It’s an unusual climb altogether, at least compared to the New England hills and mountains that I’ve hiked. The path is entirely rocky, not packed dirt like I’m accustomed to. There’s a famous pilgrimage climb that takes place every July where thousands make the climb, many in their bare feet. I had heard this before ever seeing the mountain in person, and when I got there and started climbing I was really shocked – the trail must literally be red with blood on that day because it’s so jagged and stony! Yikes. One way that climbing Croagh Patrick – and I guess almost all Irish mountains and hills actually - is much cooler than climbing ones in the States (in my humble opinion) is that it’s not covered in trees, meaning you can see the scenery around you the whole way up. I glanced behind me about ten minutes into our ascent and almost fell over I was so surprised with the scene below us – bright blue water dotted with green islands and more mountains in the distance topped with an equally blue sky. It was fantastic. Two thirds of the way up you get to a short flat bit before the final ascent where you can see over the other side of the rise for the first time, looking out over Connemara – a view very different but stunning in its own way. 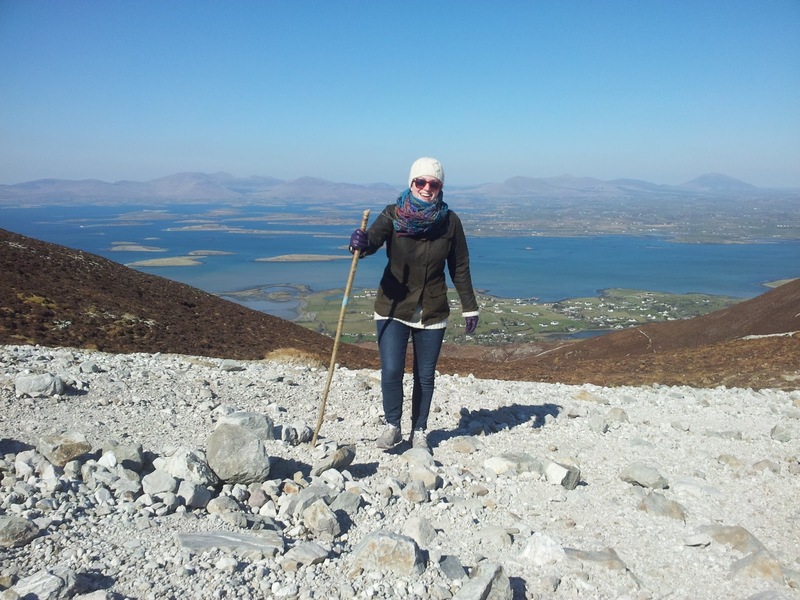 New views to the East on Croagh Patrick. And OK folks, here’s where I look uncool again. 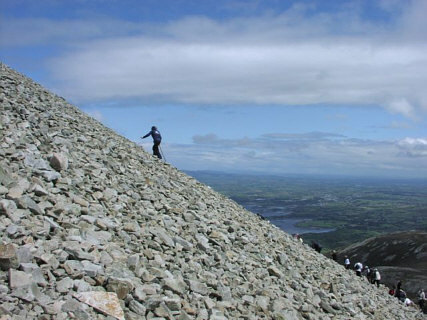 The last third or so of the climb up Croagh Patrick is a really steep, scree-covered slope. As always with these kinds of things, it really doesn't look steep in the pictures I took myself, so I've stolen this much better one from Celtic Tours. I felt pretty iffy about it, to be honest. We started up it, and stopped two or three times re-assessing if we wanted to keep going. For me it wasn’t so much going up that was the problem, it was how nervous I felt about going back down. People around us who were descending were falling quite a lot, and the loose rocks shifted constantly under our feet. After making myself keep going several times, I eventually had to say “I don’t feel safe anymore and I’m not having fun. This is it for me!” when we were about halfway up that last part. Kev was super and didn’t push me one way or the other (he’s not great with heights so wasn’t too upset going down anyway!) and we began slowly picking our way back. At the time I felt pretty stupid and defeated – children and elderly people were passing us going to the top – but looking back on it now I’m happy to have stopped before I got really scared: my memories of the climb are of the spectacular views and the sun and the wind, not terror and falling! By the time we got back to the very bottom I had a pretty impressive blister on my heel, was sunburned, had lost my gloves, and was still feeling embarrassed about not having made it to the top. To apologize for my crankiness I bought us 99s from a very grumpy man selling snacks and walking sticks (we rented ones, which I definitely recommend for anyone reading this who wants to do this climb), and we waited for the nice taxi man to come take us back to town. 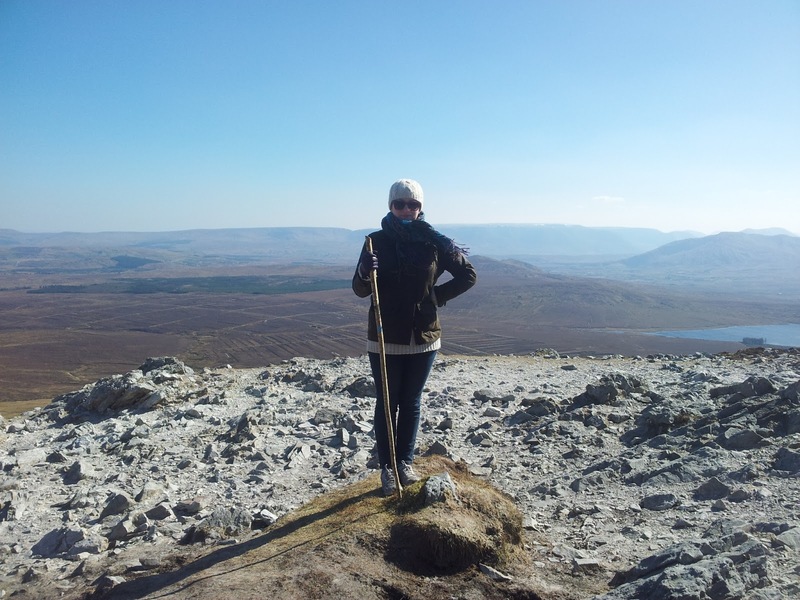 I wonder if it’s common for people to turn around the way we did, because in the past week, whenever I’ve told someone that I climbed Croagh Patrick on Tuesday, they’ve immediately said “Did you go all the way to the top?” And then I have to tell my giving up story. Oh well. It was still a great day and I’m glad to have done it, even if I stopped 100 meters before the summit!